He had read the biographies, tome after tome. And still, he wanted to know more about Gilbert du Motier de Lafayette, the Frenchman regarded as one of the heroes of the American Revolution. So, what’s a buff to do? Track down the original 1829 edition of "Lafayette in America in 1824 and 1825" on a dusty top shelf of the Brattle Book Shop in Boston, pay $450 for it, and after long days of work as a lawyer in Boston, sit at your dining room table with pen and paper, three dictionaries at your side, and translate the 1,130-page book to English using your high school French. "I thought of it as a hobby," said Alan Hoffman, who lives in Londonderry. The hobby, at the end of two years, has produced the first published unabridged English translation of the account of Lafayette’s 13-month tour of the then 24 states. Now, Hoff man is traveling the region and making appearances to talk up Lafayette and promote the book, published by Lafayette Press of Manchester, N.H "He was the most modern of men, as well as being a great man," Hoffman, 62, said in an interview. In his introduction to the book, Hoffman writes of Lafayette: "I have concluded that he was the noblest, most consistent, most principled and, in many respects, the most modern of all of our Founding Fathers, and one of the greatest men of his time." Hoffman is not alone in his admiration of Lafayette, a French aristocrat who joined the American Revolution at age 19, led key battles, negotiated pivotal French aid, and befriended America’s early luminaries, including George Washington and Thomas Jefferson. There are more than 20 cities and towns named after him, as well as a mountain in New Hampshire and a college. State banks in the 19th century printed dozens of bills with his likeness. When he returned to America in 1824 and 1825, he was a revolutionary rock star, greeted with military reviews and admiring crowds. In recent decades, appreciation of Lafayette has dimmed — a trend Hoffman attributes to poorly taught American history and the decline in Franco-American relations. Yet there remains a small but faithful cadre of fans. Societies are devoted to his memory, including the American Friends of Lafayette, based in Easton, Pa., site of Lafayette College, and, locally, the Massachusetts Lafayette Society, which annually marks the anniversary of his death with a ceremony in downtown Boston, where members lay a wreath at his monument near the Park Street MBTA station. Elaborate celebrations are being planned for September to mark the 250th anniversary of his birth. In turn, Hoffman said he has had little trouble selling more than a third of the first 1,000 books published. A second printing of 2,500 books is expected. 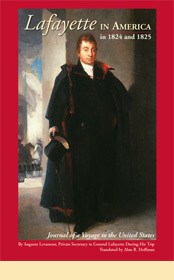 A native of Brooklyn, N.Y., who came north for college (Yale, American history major) and law school (Harvard), and stayed for work (clerk to US Judge Arthur Garrity, US attorney’s office, and, later, private practice in Boston), Hoffman is an intense man with a seemingly inexhaustible curiosity for and knowledge of all matters Colonial and Revolutionary. He can rattle off battles and regiments, but it is the philosophical underpinnings that fascinate him. "These men who fought in the Revolution were so personally courageous. They knew that if they lost, they’d be hanged. And yet they were willing to risk all for what they felt was right." Lafayette was a somewhat fuzzy figure in the pantheon for Hoffman, until 2002. "I was reading a book called ‘America’s Jubilee,’ " which described Lafayette, he said. "And I said to myself: ‘What is all the fuss about?’ "
For his birthday, he asked for a book about Lafayette. "At that point, I was hooked," he said. He read dozens of other books, one of which referred to the account of Lafayette’s return to America in 1824 and 1825 as recounted by Auguste Levasseur, a young French officer and Lafayette’s private secretary. Nearly a decade before Alexis de Tocqueville published his account, "Lafayette in America" offers a snapshot of the young country as it describes the travels of Lafayette, known as the "Nation’s Guest." As he toured city after city during the Era of Good Feelings, Lafayette was cheered by Americans for playing a role in the progress and growth the nation was enjoying on the cusp of its 50th birthday. En route to Salem, Mass., for example, Levasseur wrote: "We arrived there after noon, because, at each step, General Lafayette was obliged to stop and receive displays of affection from all those he met on this route.. . . In spite of the rain which was falling in torrents, the streets were filled with a throng which rushed headlong upon his passage, and which heaped benedictions upon him." There, too, are descriptions — with abundant, quantified detail — of the cities and towns the men pass through, and of meetings Lafayette enjoyed with John Adams, Jefferson, James Madison, John Quincy Adams, and others. "He was cherished by almost all the Founding Fathers," Hoffman said. Lafayette also was a man ahead of his times. He was an abolitionist, and counted women as friends and confidantes. And even though he was an aristocrat by birth, Hoffman said, "he had the common touch; he was a humanist." Which leads to Hoffman’s next project: An exploration of the relations between Lafayette and people of color. "That’s my leisure," he said. "Reading about Lafayette." For more information about Hoffman’s book, visit lafayetteinamerica.com. The author is scheduled to appear at the National Heritage Museum in Lexington for a talk and book signing at 2 p.m. July 24. For details, call 781-457-4126 or visit monh.org. Hoffman is also one of three speakers scheduled to appear at the American-Canadian Genealogical Society’s fall conference and annual meeting in Manchester, N.H. For details, visit acgs.org. He is also scheduled to speak at 1 p.m. Nov. 16 at the Peabody Essex Museum in Salem, Mass.